In the summer of 2018, religious studies graduate student Kyle Schofield traved to Ireland to study Attic Greek at University College Cork (UCC). The eight-week program covered three semesters of introductory Greek grammar and syntax, which Kyle describes as "a very challenging course, but very rewarding." By the end of the program, Kyle and his fellow classmates were translating sections of Plato's Apology of Socrates, Aristotle's Poetics, and Plutarch's Life of Antony. Kyle's summer wasn't just about increasing his knowledge of the Greek language, however; he made the most of his time abroad and worked in trips to see local landscapes and other treasures of the Emerald Isle. As Kyle shares, "The program demanded a lot of my time, but when I had free time I got to travel around the beautiful Irish countryside. The most memorable place I visited was Trinity College in Dublin. It was there that I saw the Book of Kells, a 9th century CE illuminated manuscript of the four Gospels." Kyle's trip was funded in part by a travel award from the Department of Religious Studies. Michael Feld came to KU on a teenage whim, inspired by a rock band drummer’s Jayhawk jersey. While here, he gained technical skills in film production and embarked upon a personal discovery through religious studies. Michael credits the Religious Studies Department as the place where he gained a deeper appreciation for spiritual practices, beliefs, and cultures, now a major part of his worldview and an inspiration when filmmaking. “I began making documentary films while at the University of Kansas and the medium has always spoke to me. My religious studies degree helped make me a more spiritual and curious person which is essential to storytelling and dealing with subjects. Often times, I’ll have subjects who I don’t agree with politically, religiously or socially but I have to hear and see through our difference to tell the right story. In the Religious Studies Department I learned to appreciate and listen to many ideas that I didn’t agree with but still were worthy of listening to. Also, as a storyteller, religion is the oldest form of storytelling, so it was a great introduction to ancient, tried and true ways of telling a great story. Torang Asadi completed her MA in Religious Studies in 2013, before pursuing her Ph.D at Duke University. Torang applied to KU to work with Dr. Tim Miller, who specializes in new and alternative religious movements in the United States. Torang found a supportive environment in Religious Studies: "KU Religious Studies has a unique master's program in which students are trained for Ph.D programs. And the professors are a key part of students' success.... If I weren't groomed by the department and prepared for doctoral work, I wouldn't have been admitted to good programs and I wouldn't have been able to pass my doctoral exams in less than three years. A lot of what I've accomplished today is rooted in the training I received at KU." Funding from KU's Department of Religious Studies allowed Torang to spend a summer doing research in Europe, where she visited Twelve Tribes communities in France and Germany (Torang is pictured with members of one such community, here), and wrote her master's thesis on the religious movement. After he graduated with a Master of Divinity from Sangre de Cristo Seminary in 1997, Seth George joined the Army Reserves. Four years later, after 9/11, he answered the call to be an Active Duty Chaplain. He was then offered a one-year study program at KU in order to be a World Religions Instructor for the Army. Ordained by the Presbyterian Church in America (PCA), Seth teaches classes on various religions, and has a special interest in both Christianity and Islam, helping students approach others who think and believe differently with humility and a desire to learn, rather than to argue. A former student even thanked Seth for helping him come to a better understanding of Islam. In addition to teaching, Seth assesses the religious components of conflicts, such as the influence of churches within Ukraine. Ben Ale-Ebrahim was interested in religion for as long as he can remember. During his graduate studies, he knew he wanted to focus on studying Islam, religions of the Middle East, and the influence of the Internet on practices and discussions of religion. Ben finds meaning in the concept of "tawhid" in Islam -- an Arabic term meaning 'unity' or 'oneness'. As Ben says, "I find it fascinating that tawhid means many different things to many different people across the Islamic world, yet all Muslims recognize its importance; there is multiplicity in unity, and unity in multiplicity. Recognizing the commonalities we all share as humans, as well as respecting our differences, is a valuable lesson [from which] I think everyone can learn." Ben found wonderful opportunities at KU -- he studied abroad in Mexico, Tajikistan, and Morocco, worked as a graduate assistant in the Office of Study Abroad, served on the board of the Persian Club, and co-founded the Central Asia Student Association. He also served as a GTA in the Department of Religious Studies. He is pictured, above, at the first Uyghur calligraphy workshop in the US -- which Ben helped organize while a MA candidate in Religious Studies at KU. The first religious studies course Oliva Groff took was a philosophy of religion course -- "Faith and Doubt", as an undergraduate student. Olivia found she enjoyed learning about different perspectives on religion, and decided to major in religious studies. From there, her studies took her many places -- studying the New Testament gospels, African Diaspora religious traditions, and Native American religious beliefs and practices. She was drawn to KU by the diversity of the Religious Studies Department and the chance to engage in interdisciplinary study with the Indigenous Studies program. Olivia says, "I think one of the greatest benefits of being a religious studies student is the awareness of other cultures that you gain. Religious studies prepares you to engage with others who hold different beliefs in a respectful manner and encourages you to learn about others... it is always interesting to see the aspects that different cultures and people share, despite their differences." Olivia also expresses how Religious Studies at KU has allowed her to exercise her teaching skills and prepared her for a career in higher education: "the opportunity to GTA for the Religious Studies Department has been an invaluable experience. The professors at KU are very open to allowing their GTAs the chance to lecture or lead class sections, and I feel that these opportunities set KU MA graduates apart from others in regards to experiences that help prepare you for the workforce." "Thanks to the support of the Religious Studies Department, I was able to do something I had never dreamed possible as an undergrad. I presented a paper on Scientology at the American Academy of Religion's Annual Meeting in San Antonio. Thanks to Dr. Miller’s continued encouragement, I was able to develop my 5-page paper into a 20-minute presentation and submit it to this conference. I never thought it would be accepted, but when it was, the department immediately offered to help fund my trip. With this offer, they gave me not only an invaluable experience education-wise, but one that also reaffirmed my love of the field of religious studies.I came here to study biochemestry and found not only my true passion, but a collection of people willing to support and nurture that." Before graduating in the spring, Tirzah was hired full-time as a development assistant at KU Endowment. She currently works there while contributing to her relgious studies' YouTube channel, Ground Up Religion, and has plans to apply to graduate school. 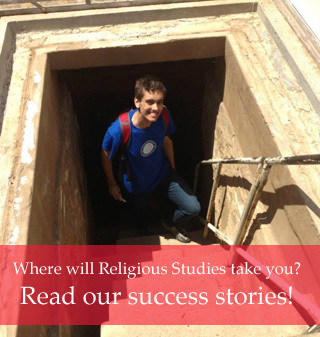 Religious Studies provides a broad-based foundation of cultural, historical, and artistic background that helps students hone their research, communication, abstract reasoning, and direct observation skills. It provides a forum for asking fundamental questions about human existence, and as a department that encompasses multiple disciplines and area studies, Religious Studies at KU allows student to nurture specialized interests, preparing them for continued academic work or dynamic careers. We invite you to explore these real-life stories of students and alumni. Has studying religion made a difference in your life? Let us know!